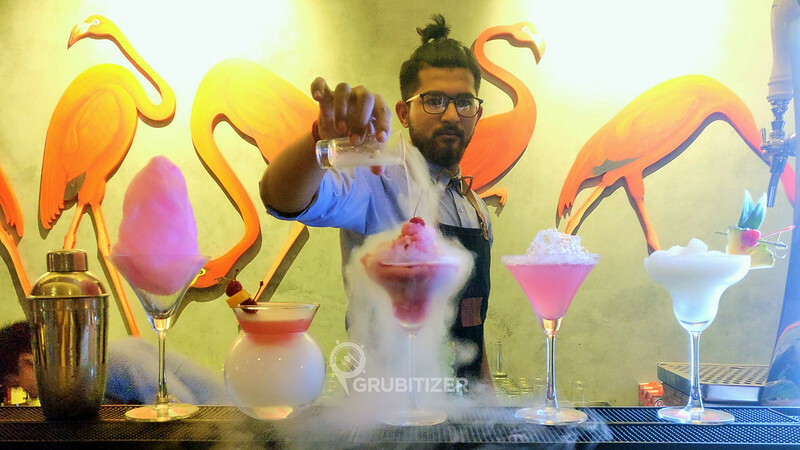 612 East is the newest party place in the busy space of Indiranagar, the thumb rule followed here will definitely want you to check this place out and am sure you’re gonna fall in love with it. In their words – There is beauty in simplicity. Created, keeping in mind and soul all the elements that make a destination a home i.e Water, Fire, Air and Earth, 612 East has been designed to let its guests enjoy the simple pleasures that all come together to make a great time out. Whether it be great food, a signature drink, the music you love or impeccable service, 612 East hits home on all fronts. This three floored pub has one of the most extensive food menus which is designed in a unique way, an elaborate list of cocktails options that is going to awe you and some brilliant retro music being played in the background that is sure to let you have a good time! We were here on an invite to check out the new place and ended up trying a pretty exhaustive range of cocktails, each one of them looked fancier than the other making up for a good set Instagram posts. We started with the signature cocktails and here’s what how they look like – Smoking Martini came in with a lot of dry ice beneath it, I would call it perfect display of theatrics on the table, it is a mix of vodka, triple sec, green grapes, pomegranate & lime with dry ice. Sangria Slush from the frozen water section and as the name suggests this one is a thick concoction of white wine, triple sec, brandy mixed berries, and cinnamon. Molecular Jager Bomb comes in from the flames & fire section and as the name suggests, it is Jagermeister tossed in red bull. My favorite was the Mystic candy 495, this one comes in as cotton candy and has rum, bitters, lime, and mint, slightly on the sweeter side which makes you drinking easy! Ordering bar bites here is a bit of a task, well if you are aware of what type of cooking style suits you best then you are sorted as the menu has pre classified sections containing – Tandoor, Stoned, Smoked, Fried, Grilled and Baked. We had a mix of dishes from almost every section and I must say there is hardly any scope of it trying to disappoint you. The Twice Cooked Pork Belly was an instant hit, the slow-cooked braized pork belly tossed with hoisin sauce. Sesame Tennessee strips will go well with your beer, the chicken strips are deep fried and coated with Tennessee sauce giving it a nice smoky feel. The pub grub in recent times have gradually matured to Pizzas and Burgers as well and at 612 East offers some of the best options here, Burgers here can be had in either Classic, Green, Red, Yellow and Black variants and are accompanied with Tomato Mustard relish, Coleslaw, French fries and pickled onions and gherkins. A lot of dessert options and I got to try the super delicious Moist Brownie with Espresso Mousse which I can have all day long, the brownie is as moist as you would expect and the espresso shot gives it a nice bitter-ish tinge to it. Overall, 612 East is that young and trendy you would want to be in, the place feels premium inside out. Rohit Barker and Shyelsh Jain have done an amazing job at taking the party scene of Indiranagar to a different high … Cheers! Next Post: Celebrate Oktoberfest at The Irish House!